I love applique and am just starting to learn the differnt techniques. This book looks like just what I need! Everything you need to know for any applique project in one place? That sounds like a “must have” book! Thanks for sharing it with us, and thank you for the chance to win a copy! This book would be perfect since I am just learning how to do applique…..thanks for giving all of us a chance to win…. Wow! If the book is as well thought out as the packaging (spiral binding) it is a WINNER! Can’t wait to see it. This looks like a fantastic resource, if I don’t win it, I’ll have to go buy one! And I love it when they spiral bind craft books, it makes it soo much easier to reference when working. Oh MY! OH MY! I would absolutely LOVE to have this book. I have always had a mental block when it comes to applique. I did my very first on two of my blocks for the Red, Wite, & Blue hop. I think I am ready to move on to try it some more..( I have UFO’s that are not finished because there are parts that need to be appliqued.) This book would be fantastic! Thank you for sharing the book and for the chance to own my own copy! Oh, the book looks wonderful! I’m a fairly new quilter and have just taken a class in applique. What a great resource this would be! I love learning!! Thanks for the chance to maybe win this book. I would love to win this book! I’m sure I could learn many new techniques from it. That book looks remarkable. It is nice to find various techniques within one book. Feel free to send it my way!!!! I would love to win this book. appliquéing is my passion and I enjoy learning new techniques. Just from seeing the cover, with the beautiful Iris and decorative stitching…I’ve so much to learn about applique! So glad to see the book is spiral bound…this makes it so much easier when working on projects. Thanks for the giveaway. Thanks for another great review of a book that looks like a wonderful resource. If I don’t win it, I may have to go purchase one. This looks like a great book. I LOVE the spiral back that keeps it open at the right spot. I have their book “Thread: The Basics and Beyond.” It is wonderful. If i won this, I could have a matched pair! Applique is my favorite technique – I’d love to learn “beyond”! Thanks for the chance to win this book. Ooh! What a great book to have! I love to make different kinds of appliqué and would love to look through this book for new ideas. Thanks for the chance to win. Looks like a wonderful book and the spiral binding would really be nice. Thanks for a chance to win! This looks like one I would really enjoy owning. Wow, this book looks fantastic! Wonderful to have a resource with all the techniques under one cover. Thanks for the opportunity to win. I really enjoy learning about all the different applique techniques. Thanks for sharing the information in the book! Looks like a great instruction book. I would love to learn more applique techniques. Thanks for sharing it. Wow! I agree that if this book has all that is promised it would be a great resource. I have been needle turn appliquing for a while now but have developed arthritis in my wrist and fingers so I’m looking for a different way to do the applique. This book looks like it should give me some ideas. This book would be a great resource as I learn to applique. Thanks for the opportunity to add it to my library! I’ve just about reached the end of my first applique project and have barely scratched the surface of how to handle so many of the tricky corners and layering. 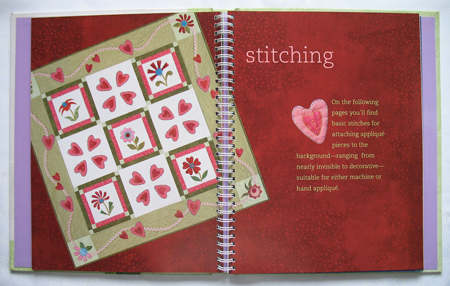 I’d love to win this great sounding book to guide me through the next applique journey. It has become a new passion for me. this book is right down my alley! i love applique and need a [hmmpf] … little more info and instructions to make things look a little better. thanx for the opportunity to win a copy. This book sounds wonderful! I am addicted to applique and would love to read about new techniques! Wow. This looks like a fabulous book. I’m partial to needle turn appliqué but find sometimes it doesn’t suit the project at hand. I’d love to win a copy of this book and have more methods at my disposal. I love the pictures you posted on your website. I’m always looking for new applique projects and ways to hone my own skills. I would LOVE to win this book! Crossing fingers and toes! I have been doing needleturn applique for a number of years, but I find I can always learn new tricks from books recently published! I am a newbie to appliqué and would love to have a copy of this book. It looks like a great learning tool!! That iris is gorgeous and I would love to learn from this book! A friend had this book at a recent class. I looked it over and it is excellent. I would love to win it. Hey Kay, that book looks like just what I need to expand my horizons! Old Arthur pretty much prevents anymore hand sewing, but I enjoy doing machine applique & I’d love learning how to take it to the next level. I generally do blanket stitching, rarely zig-zag, and I’d like better results going around corners & curves! I love that the book lays flat – someone really smart must have thought that up!! Thanks for getting a give-away copy!!! Looks like a lovely book ! And comprehensive, too. Thanks for sharing it with us ! It looks like a great book and looks very easy to use. It sounds like it would be great for beginners. Thanks for sharing this copy with us. 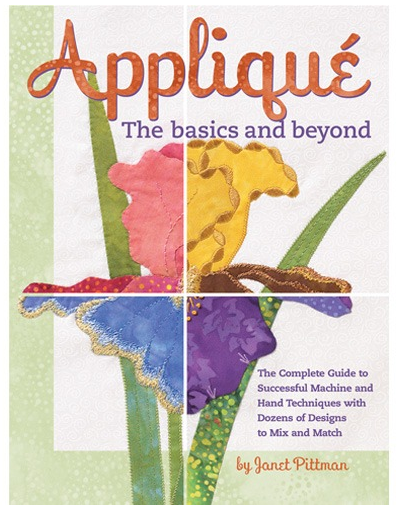 I haven’t tried applique yet, but the book looks very interesting and would be very helpful. Thanks. Thanks for a chance to win! Looks like a very useful book, full of techniques. The book sounds great. It would be super to win. Wow this looks like a great book! I am still learning how to applique and have never been able to figure out which method would be best for me. Thanks for the chance to win! If it is anything like your books it must be a wonderful book and I love that it is spiral bound. Thanks for the chance to win. I love applique and am testing all the methods now to see which one I like or am successful at best. This sounds just like the book I need. Thanks for the chance. I’ve been doing some applique. This book looks like a great resource. I love Applique and think this book would be a wonderful resource. I do some machine applique, I am just starting to learn hand applique this book looks like it would be beneficial in this pursuit. Thank you for the chance to win. I certainly would love to read this book. My applique skillls are limited but I admire all the experts out ther. I’m intrigued just by the cover and the decorative stitching she’s used to add a little flair to the applique edges. This book is ready to make me to a first applique. Such great style of book. So many styles of applique to teach how to do it so well. I would love to win. Thanks for the great review. This sounds like a must have book. I would really love to add to my library. Just the thought of several different methods of applique all in one book sound great. Hope to win. I always love books on appliqué and would love to win this one. I have a friend who is learning to needle turn applique, (which I don’t do!) I can’t help her much but this book would be a great resource and help to her. I love helping new quilters fall in love with the journey of quilting! Also very thankful for people who write such great books. This books looks fantastic. I have used several techniques mentioned in your blog, but I’m always having to hunt around to find the tutorials/information the next time I want it. To have it all in one place would be so handy! This looks like a great book. One that I would buy. I like that it is spiral bound. Happy 4th of July! I think that I’ve tried all the different methods of applique and have tried any new one that has come around the corner for both machine and hand applique, since about 1980. Would love the new book to add to my library and see if I missed one to try and use. Thank you. This looks like a great book – I just started applique so I am sure it would use it a lot! thanks! I love the look of this book – and spiral bound is wonderful! thank you and happy 4th! I love everything about applique…but I certainly don’t know everything. Janet’s book looks packed full of techniques that would help me go ‘beyond the basics’. I always read your blog.Thanks for this giveaway and for the information on your blog. Kay, thank you for having this giveaway! I love applique, pure and simple. There’s nothing about it I don’t like. I have so much to learn; I’m sure Janet’s book would go far in instructing me in techniques I don’t know. I have never got the hang of applique so would love to have a great book on the process.. have more time now for hand work so would be just the thing!!! I love handwork and would like to improve my applique techniques. I’m starting to hand applique again. This book looks like a good refresher course for me. Thank you so much Kay for the chance at winning this book. It sounds perfect & I can never learn enough about applique! Oh, this is would so perfect, the timing. I was asked to teach an applique class, which I only do freezer paper technique so this would be perfect for the class and to be able to show different possibilities. After a 20 year hiatus I have recently returned to quilting, I would love this book to remind me of techniques I am sure to have forgotten! Thanks for the opportunity. Thank you so much for the opportunity to win this book. I love to applique and can never have enough instructional resources. It looks like a great book! I would love to win this book, I just love applique, I’m still learning the various types. Please put my name in the hat, I will keep my fingers crossed. Looks like a comprehensive book for newbies and experienced appliquers as well. What a nice giveaway! I am fairly new to applique so this book would be perfect for me. Thanks for the chance to win it! This would be a great book for a beginner like me. THANKS! Oh my goodness, I would love to have this book! Please count me in. I do hope you meant Saturday the 7th! I would love this book. I’m planning workshops for my guild, and I hope one of them will be all about applique. I’m sure I can learn a lot from this book that I could share with them!